This post is a work in progress, I’ll be updating it as I progress more. Despite not having much myself to show for on operating IT infrastructure, almost all my projects require bits of operation knowledge here and there; in a desperate attempt to fill my last holidays’ hot noons with productive intent and also to delve a little deeper into operations, I set out to conquer the holy grail of ops: create my own, private cloud. My current job at AMOS is about PaaS and – all benefits regarding efficiency, performance and availability put aside – I value the substantial simplification of cloud resource provisioning as opposed to ordering resources from an internal department. Whereas requesting a new (virtual) server or extra storage space can easily become an exercise of patience in large enterprises, cloud infrastructure provisions virtual resources in minutes with added benefits such as isolation for extra security. Thus, the main goal of this exercise is to develop a platform that simplifies container allocation to the maximum possible extent. Virtualbox for providing a set of virtual servers and isolating networks. This is just a convenience facility since I don’t want to set up a real data centre with real hardware. I could be using real and/or remote virtual servers, but I often prefer working offline (for instance, during my holiday when I wrote this post) and having local VMs to play with comes quite handy. There is a single, master VM which routes external network traffic to the node VMs and manages deployment tasks of applications on node VMs. Node VMs run applications and connect to the manager VM via a private, internal network. Ubuntu 14.04 server will be the base operating system to run all software on. 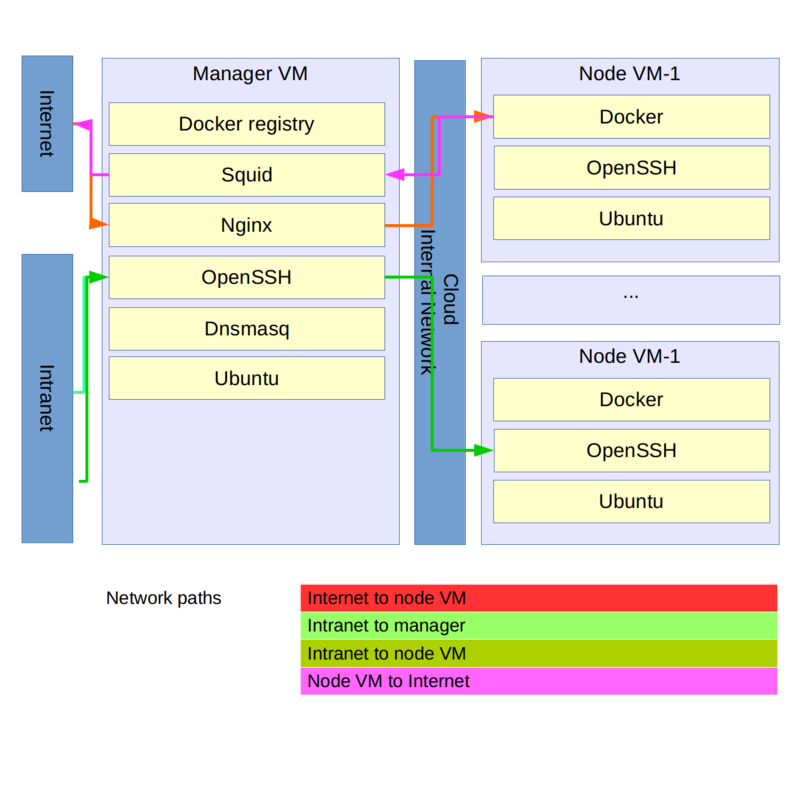 Docker will be used for packaging applications and running them in containers on the node VMs. I was toying with the thought of using Quemu instead because it would allow running entire operating systems in the cloud instead of Linux containers, but packaging applications for Quemu might have been a bit more of a challenge than packaging Docker images. 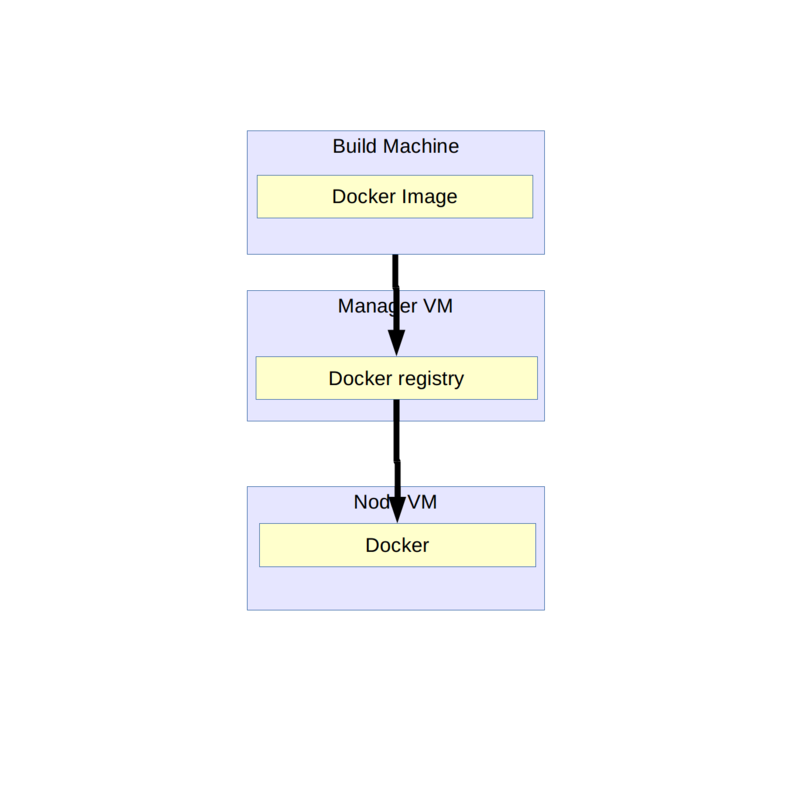 The master VM will run a Docker registry which will store all application images that run somewhere on a node VM. Dnsmasq for providing node VMs with an IP and making them accessible under DNS names. Squid for routing network traffic from the virtual machines to the outside world. For the scope of this exercise it wasn’t terribly useful because there isn’t a universal Linux standard of how to tell applications to use an HTTP proxy; in short, having node VMs using Squid was messy and I resorted to connecting the node VMs directly to the internet for the few times I needed to download something to them. Varnish for routing HTTP traffic from the outside world to applications running in the various VMs. It’s important to get version 4 because of its ability to declare backend groups programmatically – version 3 is default in Ubuntu 14.04. In this cloud there will be two types of VMs: managers and nodes. 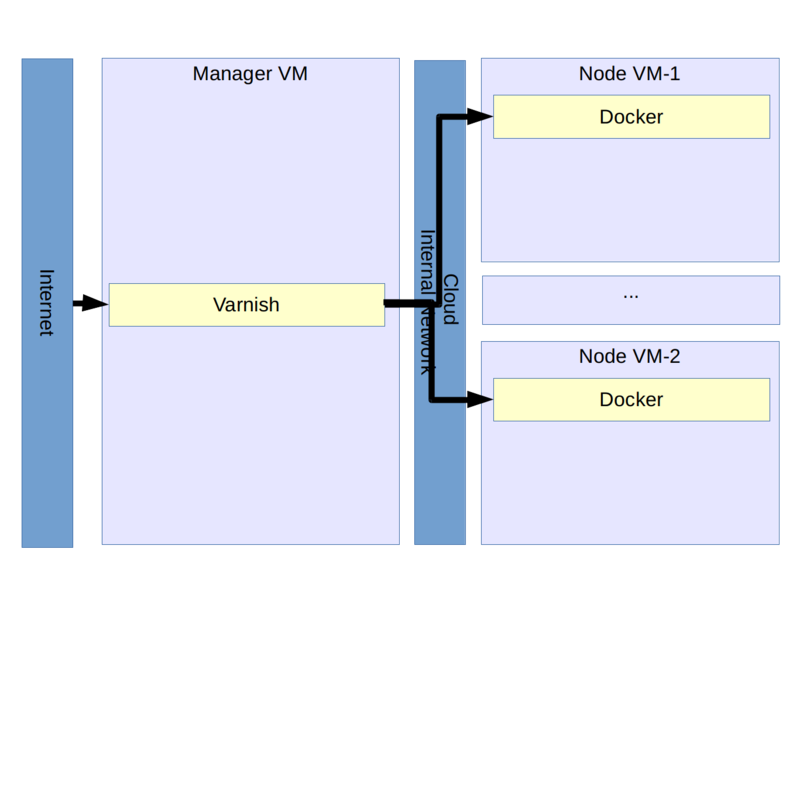 In particular, there will be one active manager that runs Varnish, Docker and the less important Squid, and several nodes that receive work from the manager. Let’s first set up the manager: create a new virtual machine with Virtualbox, let it have a NATed Ethernet interface for talking to the internet (quite useful for installing all the software we’ll need) and an internal network for talking to the nodes which we’ll set up later. We’ll probably need more ports (like HTTP and HTTPS) later on, but for now SSH shall suffice. 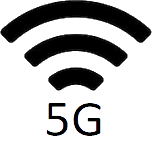 The internal network will be the private 10.10.10.x subnet with the domain name “matrix”. Any nodes running in that subnet won’t be able to see the internet, yet. The trick here is that we’ll use Dnsmasq as both a DNS and DHCP server. We’ll later copy this key to the node VMs. The idea is that we’ll push (and tag) any image first on the matrix-manager registry and then have the node VMs pull those images from the registry, similarly to a maven nexus repository. starts the private Docker registry on the master VM and will make sure it always runs when the VM is rebooted. 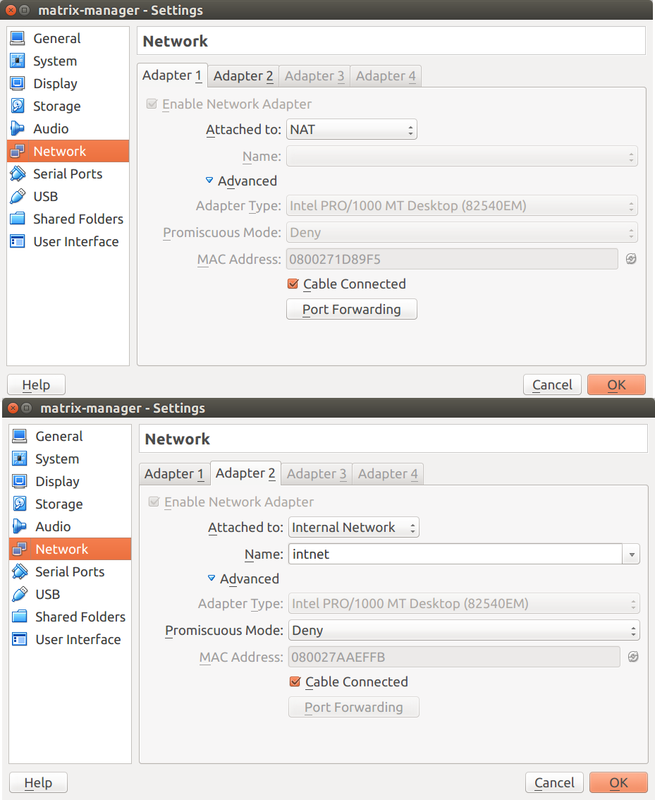 In short: set up again a virtual machine, give it a single Ethernet network card which maps to an internal network. The idea is that node VMs can’t “break out” of the cloud; any network communication with either the intranet or the internet happens through proxies installed on the manager VM. 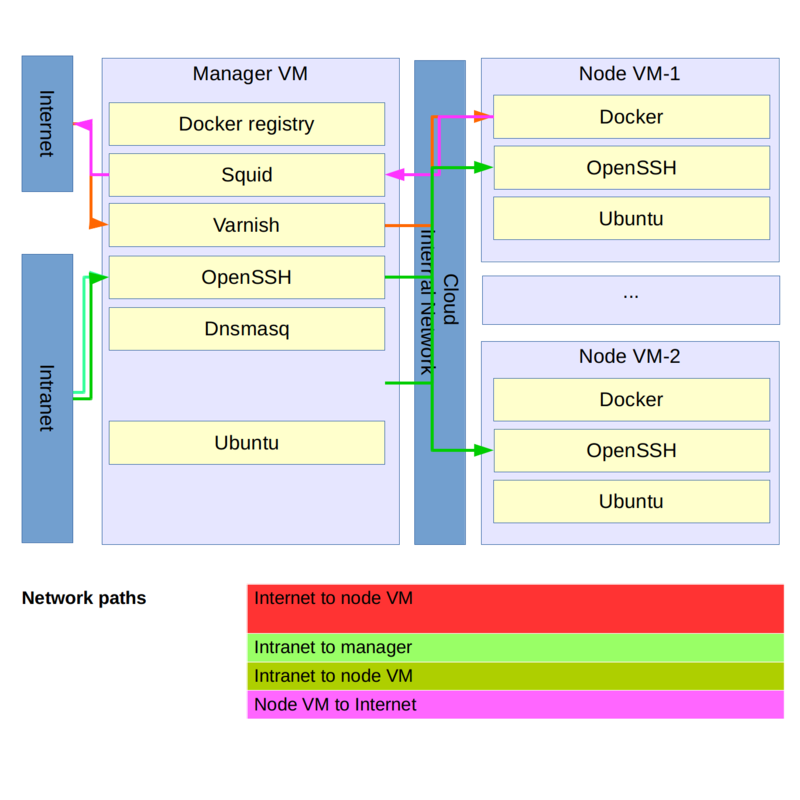 Users can access web applications running as Docker images on the node VMs through a Varnish proxy running on the master VM. 1. As a developer, I’d like to install web applications in the matrix. 2. As a tester, I’d like to be able to use web applications in the matrix. 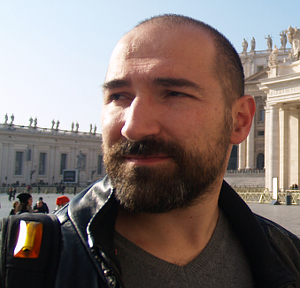 The first script, create-image, packages an application into a Docker image. The script would typically be executed on a developer’s workstation, requires a Docker installation on the workstation and will store the application image in the local registry. The next script, install-image, is executed on the master VM and pulls the application image to our master registry. The run-container script logs into a node VM via SSH, pulls an application image from the master VM registry and runs it as a container. Since we’re interested in web applications, the script will also bind HTTP to a local TCP port over which the application can be talked to. Another interesting script is deploy-applications-plan which reads instructions from a file which describe which application images to install on which node VMs. Last not least, update-proxy reads the same application deployment plan and creates a VCL file for Varnish which maps HTTP requests to containers running on specific node VMs. So let’s get started! The action plan looks like this: deploy two Java web applications that output a simple “Hello world” to the cloud and access them via a web browser. Step 1: download the applications test-image1 and test-image2 from https://github.com/ggeorgovassilis/cloudmatrix/tree/master/home/cloud. Step 4: create an application deployment plan (for inspiration, look at applications.plan in the code repository). You must know the node names for this, so maybe run the master VM and a few node VMs first in order to determine their DNS names. Step 5: run the deploy-applications-plan script which will execute the application plan on node VMs. Step 6: run the update-proxy script which will have Varnish map application URLs to the respective nodes. Step 7: map a convenient TCP port via Virtualbox networking to Varnish’ 6081 port. For this example, I’ll use a 1:1 mapping and use 6081. Step 9: verify that failover works. Shut down one of the node VMs via the Virtualbox control panel and verify that Step 8 still works.